Welcome to today’s Toolbox Tip and as you can see it’s about ‘Marketing Building Blocks for a trade business’. I’m Jon from Small Fish. I’m a business coach and I help people grow and scale their trades businesses, and part of that is getting your marketing right. I’m sure I’ve said this before. Where to spend your marketing money? Now, I see a lot of questions on the groups, the Facebook groups, with people asking where to get them, where to put their money, where to find work, how best to do it. So this is my view of where best to spend your marketing resources. Because the marketing you need to spend is sometimes time and sometimes money. So: your marketing resources: time or money. Now, lots of people are asking things like, should I build a website? Should I invest in Checkatrade or Hipages? Or Oneflare? Or Rate Builder and things like that? And they’re fair questions and reasonable questions, and of course the answer is it depends (sorry). And I’m going to try and give you my thoughts on how to think your way through where you should spend your money. And we’ll start by having a think about what sort of trade business yours is. I’m just going to quickly say I’m a business coach for trades businesses that want to grow and scale. So you’re a bit bigger, you’re not just a one-man band anymore, you’ve got some people working for you and you’re looking to get a bit bigger and you’ve got some money and time to invest in this. You’re prepared to invest in this. So my advice is for people who’ve got some resources to invest and got that ambition level. Now, if you’re a one-man band and you can’t afford to do some of the things I’m going to suggest, I’m sorry the advice isn’t really aimed at you. I will try and cover what you could do but you’re probably stuck with things like checkatrade and the like for the time being. First, I’m going to explain the different types of trade business, and then I’ll talk about what the building blocks are, and then I’ll say which types of trade business should use which building blocks. I hope this makes sense. I hope it’s not too complicated for a Toolbox Tip. You can do jobs or projects to consumers. You can work with consumers. You can do bathrooms and kitchens, and plumbing, and electrical services to people at home. You can do them to small businesses. You can work predominantly with repeating clients, builders, so you might be a subcontractor working with builders or you might work with major corporations. You might be a builder who mostly does work in conjunction with architects or at least get your customers through architects. You might work with property managers or real estate agents or strata managers. And you might work with large corporates and big businesses. And the marketing you do, depending on which market your business services, is going to be different. I come across a lot of people who sell and do all those things. Now, there’s a massive cost to you in doing all those things because you’ll have to use all the building blocks. So maybe consider focusing yourself on a specific market. It’s a topic for another day, but there you go. Let’s have a quick think about what the building blocks are. As you can see, I’ve drawn them a bit like bricks because I think that’s fun, right? I will expand a bit. ‘Find Me’, that’s making sure you get found when people go looking and I think this is really important for a trade. People know when they need a plumber and they go looking. They hit Google and they go ‘plumber in their area’ and you need to be found. That’s ‘Find Me’ marketing, website, SEO AdWords, checkatrade, hipages, yellow pages, all those things find themselves in there. Recommended Reading: Search Marketing (Generating enquiries for your trades business) Are you being found? ‘Interrupt’ is advertising, any kind of advertising, newspaper advertising, Flyers, Facebook advertising, magazine advertising, all that stuff. I consider it interrupting. You’re interrupting people from what they’re doing. “Stop watching TV, look at my stuff.” “Stop looking at Facebook look at this kitchen,” that kind of thing. ‘Site-specific’ are covered in last week’s video and what I’m talking about there is your signage. You’re on site with your physical presence, you’ve got people on site, vehicles on site, you can have signage on your people on your vehicles, and you can leave signage behind when you finish work so you can make your presence felt. And your customers are usually near where the works done so you can make your presence felt. ‘Relationship’ marketing, it’s particularly important if you’re going to do repeat business with people. You build a relationship with them and it’s worth investing in that relationship because they’re likely to give you job, after job, after job, after job so you’re going to invest in that relationship. And often, that really means calling people up, go and having cups of coffee, making friends, building trust, helping them understand what you’re good at and not and generally building that relationship and that knowledge between the two of you, and when they can give you work. And the last one is ‘Referral’. If you do a good job, you get word-of-mouth. Doing ‘Referral’ marketing is about asking people to give you word-of-mouth, to refer their friends. 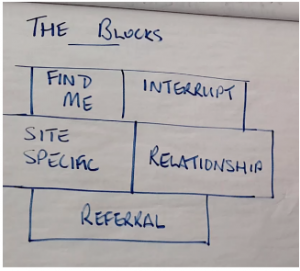 What marketing building blocks should you use? I’m not going into the how-to of each one today. 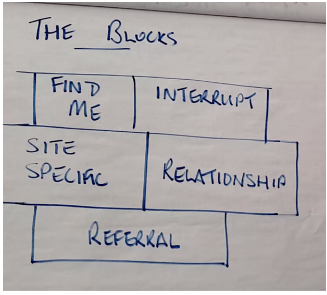 I’m talking about what building blocks you should use. So let me finish this off. If you do small jobs to consumers, they’re probably going to hit their phone and hit Google and find you, or find somebody, so you need to invest most of your energy in to ‘Find Me’ marketing. Have a good website, spend money on either SEO or Google AdWords or both of them, make sure you’re on that map, (I’ve gone through this before), make sure you get found when people are searching. That’s your primary focus for all your marketing. That’s where you should be spending all your money. You can do your ‘Site-specific’. Your signage is good but mostly it’s important so that when they go and hit their phone and they see you, they recognize your colors and your vehicles or whatever and they’re familiar and press on your site. There’s a little bit of ‘Relationship’ marketing you can do. Mostly, about fridge magnets and things, but really put your effort into being found. If you sell to small businesses, shops, and cafes, and the like, do the same but invest a bit more in those relationships. You’re going to get repeat work from them. You’re going to be banging on doors and making friends and staying friends with people but they’re not worth the same attention that the bigger repeating clients are. And if you work with builders, architects, real estate agents, and major commercial businesses, you’re going to invest very heavily in those relationships. And of course, what I mean there like I said, it’s calling people up, making friends and staying friends, and you’re going to put structure and system around how you do that. I’ve come to the end of my presentation, I hope that makes sense. If it doesn’t make sense, I’m sorry (or you can book a chat with me and I’ll walk you through it a bit more). I normally spend two and three hours and many weeks with my clients getting this clear, getting their heads clear about what they want and how they want to invest their resources in their marketing. I’ve tried to cover it in a few short minutes. I hope it was helpful. See you later!